On January 20th of this year, Josh Zollweg of joshZie’s Whisky Review created a group on Facebook called Whisky Bloggers. As of this writing, the Whisky Bloggers group consists of 99 members with incredibly diverse backgrounds. While there are several members that I consider professionals in the whisky industry (i.e. whisky-centric journalists and published authors, whisky retailers, whisky importers, brand ambassadors, etc. ), the majority of the members blog about whisky in their spare time. Though our backgrounds may be diverse, we all share a love of this wonderful spirit and a willingness to share our whisky drinking and whisky blogging experiences with each other and the global whisky community. One of the most active members in this group is Johanne McInnis of The Perfect Whisky Match blog. As I have learned through our numerous interactions on Twitter and Facebook, Johanne is one of the most enthusiastic whisky lovers on the planet. Much like Joshua Feldman of The Coopered Tot blog, Johanne has perfected the art of weaving the #WhiskyFabric. While there may be some exclusive whiskies out there that few of us will ever get to sample, thanks to people like Josh and Johanne, the whisky blogging community is incredibly inclusive and I am extremely grateful to be a part of it. 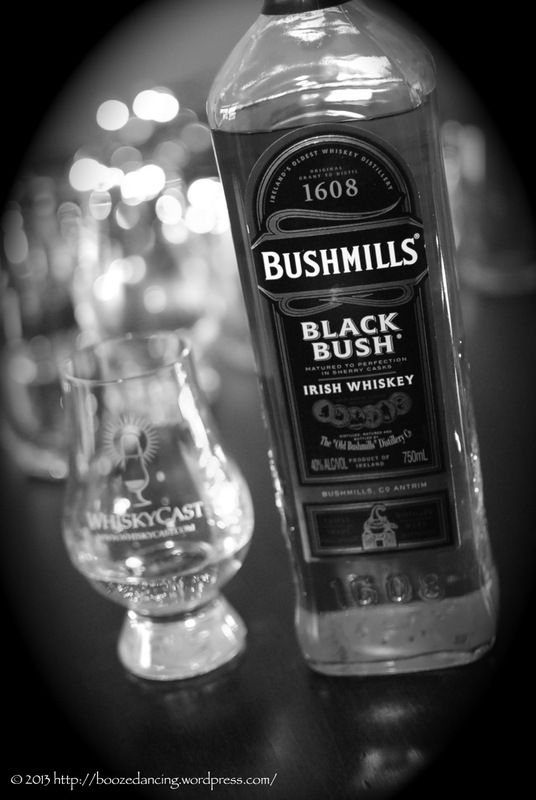 ST PATRICK’S DAY BUSHMILLS BLACK BUSH BLOGGING! 4:00 PM Greenwich Mean Time. The point is to have as many whisky writers/bloggers/vloggers post on St. Patrick’s Day (concurrently if we can arrange it) about an affordable and easily accessible whiskey. Would be awesome to see how many different countries/people take place. Post whatever you like, just POST!!! The point of a FLASH MOB is to take people by surprise and storm! So, let’s create the largest joint blogging/writing review/story about a whisky. This has never been done before so let’s do it and have some fun! For those who may not be interested in actually posting, any help to spread the word would be FANTASTIC! As of this writing, there were 24 confirmed participants in this whisky blogging experiment. Links to each of their blogs will be included at the end of this post. Appearance: Light golden-yellow with nice legs. Aroma: Soft with hints of vanilla, menthol and astringent. Taste: A little thinner than the legs would suggest. Sweet with a peppery, then cinnamon spice (not quite a Big Red) followed by a slight warming heat with the customary flavors of a meadow and a faint hint of ash. Conclusion: I am a big fan of Irish whiskies as I love the sweet hits of sugar, honey and vanilla and look forward to the notes of heather and mint. I usually go for Jameson, Red Breast or Midleton so the Bushmills was a nice change of pace. I was a little surprised by the spice and heat as the ABV would have suggested a more muted flavor profile and the nose gave no indication of the heat. If this were bottled at a higher ABV, it might bring it into the Red Breast category. As it is currently bottled, I would put it on a par with the special Jameson bottlings (the Gold or the Crested Ten). Appearance: Pale copper copper with lots of thick, slow moving legs. Aroma: Quite muted on the nose when I first poured it into my glass. Letting it rest and open up definitely helps to bring out all of the aromas. The Sherry cask influence is readily apparent. Fruity at the onset with hints of raisins and ripe bananas. Also getting some cinnamon, allspice, and vanilla. Taste: Medium mouthfeel with just a touch of oiliness. Much more heat than I was expecting. The sweetness in the nose carries through to the palate and brings a healthy dose of cinnamon spice to warm the front third of my tongue. The heat intensifies at mid palate and leads you to a soothing and lightly spiced finish. There’s a a bit of a cigar tobacco aftertaste that fades after about a minute. 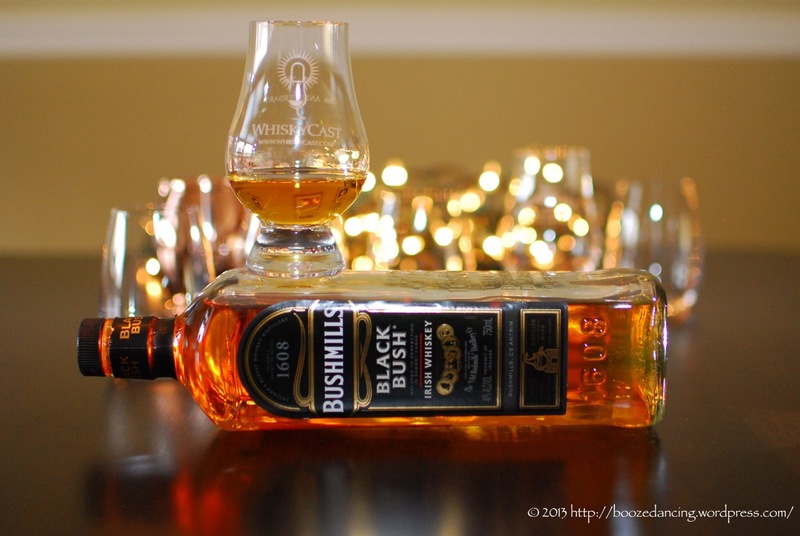 Conclusion: When the Whisky Bloggers group picked the Bushmills Black Bush as the subject of Johanne’s #FlashMobBlog experiment, I was a bit disappointed. While I definitely enjoy Irish Whiskey (the Redbreast 12 and 15 are my favorites by a country mile), I have always found them to be on the gentler side of the whiskey spectrum since it’s no secret that I prefer a more robust spirit. About two weeks ago, Limpd was kind enough to let me sample several of his Irish whiskeys alongside the Bushmills Black Bush. I am happy to report that the Bushmills Black Bush stacked up quite nicely against the competition. Although I preferred the Redbreast and Jameson 12 year old expressions, I would say that this whiskey was just as good as the Jameson Crested Ten, and several notches above the standard issue Jameson. My only complaint with the Bushmills Black Bush is that I wish it was bottled at a higher ABV since this would definitely help to intensify the finish. Why are my people doing this instead of organizing a Park Slope Brooklyn Shake flash mob review of He’Brew Jewbelation Sweet 16???? Yet another sign of the triumph of the assimilators. Shame. Where’s my glass? Great pictures (of course). Apparently, your people are big fans of Whisky. As far as your glass goes, you know we always have enough to share. You just need to take the wheel of your automobile and swing on down!